The Hispanic Film Festival is a showcase of Spanish speaking films from Spain, South and Central American countries. 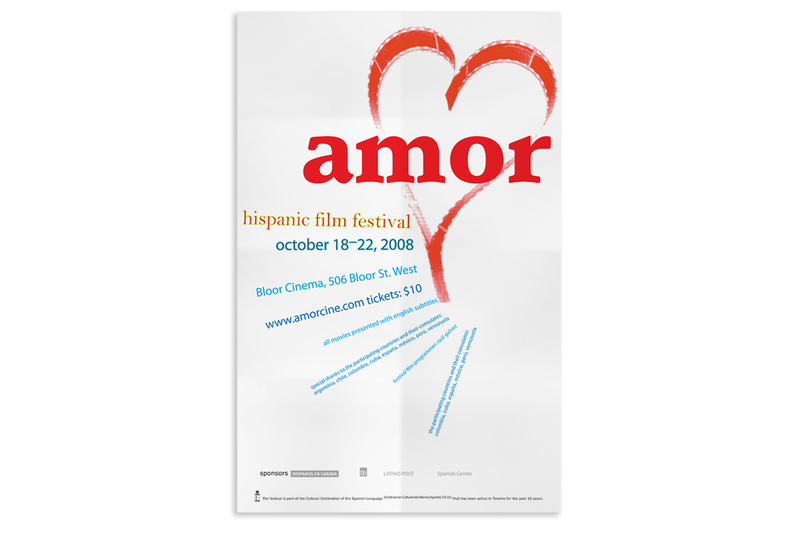 The theme of the 2008 festival was "Amor", which means "Love" in English. It was not only a theme of the films shown, but also a love of films/cinema. My approach to this theme was to tape two film strips together to create a shape of a heart. I then overlaid the heart with the word "amor" set in a bold serif. The information for the festival was laid out typographically in such a way to give the emotion of falling in love. The entire creative approach to the poster not only played off the festival theme, but it also served as communicating a secondary message which was "for the love of movies."